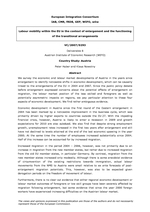 This study analyses the implications for the Italian labour market of the recent dramatic upsurge in immigration from the New Member States and the Candidate Countries after the 2004 and 2007 enlargement within the context of the current Italian immigration policy. The study documents the most salient features of the immigrant population before and after the enlargement with respect to demographic characteristics, skill structure, labour market participation, occupational sector, underscoring the main differences and similarities within immigrants subgroups (New Member States vs. Candidate Countries) and between native and foreigners, and discussing their overall implications for the Italian labour market. The main conclusion of the study is that immigrants from NMS-10, NMS-2, and CAND-6 represent a vital resource for the Italian labour market, having contributed substantially to national employment growth especially in the latest years. Further, immigrants from both New Member States and candidate countries appear to act as complement rather than substitutes of native labour given the high national demand for unskilled manual and non-manual workers and for personal and domestic care workers.